High-speed rail in East Asia refers to the high-speed rail systems of China, Japan, South Korea and Taiwan, which together are approaching a length of 15,000 km (9,300 mi). The Shanghai Maglev Train, a turnkey Transrapid maglev project, imported from Germany, is capable of an operational speed of 430 km/h and of a top speed of 501 km/h. It has connected Shanghai and Pudong International Airport since March, 2004. In April 2007, China opened several high speed rail lines between major cities, providing a network of 6,003 km, making it the world's largest high speed rail network. By 2012, China will have a 110,000 km rail network. Of that amount 13,000 km will be high speed rail, some line capable of going over 350 km/h, making CRH the largest, fastest, most technologically advanced high speed rail system in the world. However, the Maglev line has suffered from low ridership, and as of 2008[update] various expansion plans (e.g. to Hangzhou) remain stalled. The Qinshen Passenger Railway (Qinhuangdao-Shenyang), China's first conventional high-speed line between, opened in 2003 with a maximum speed of 200 km/h (to be increased to 300 km/h). The Beijing-Tianjin high-speed rail, the first in China to support 300+ km/h, opened in August 2008. The Shitai Passenger Railway (Shijiazhuang-Taiyuan) started operating on 1 April with a speed of 250 km/h. The construction of the 1,318-km Beijing-Shanghai Express Railway started in April 2008; tracklaying began in July 2010. Additional lines are also under construction so that by 2015, the high-speed railway network in China will be larger than the combined length and capacity of the rest of the world. On December 9, 2009, China test-ran the world's longest high speed railway line - the Wuhan-Guangzhou High-Speed Railway, which reduces the travel time for the nearly 1000 km from Guangzhou to Wuhan to just over 3 hours. The maximum speed on this test run was 394 km/h. Commercial operation of Wuhan-Guangzhou High-speed railway between Guangzhou North station and Wuhan station started on December 26, 2009, at a maximum speed of 350 km/h. The last section of the railway between Guangzhou North station and Guangzhou South station was opened on January 30, 2010. Japan might be considered the pioneer of modern high-speed railways. Pioneering modern high speed rail, it also has the most heavily travelled, and was the largest network (in km) in operation until China opened 6,000 km of high speed lines all at once in April 2007. Construction began in 1959, and in 1964, the world's first line, Tōkaidō Shinkansen opened to the public, then operating at a speed of 210 km/h. A maximum speed of 443 km/h was recorded in a test run in 1996. Japan is an extremely densely populated country; more than 70% of the land surface is mountainous and thus uninhabitable or unsuitable for road travel and parking. In fact, drivers must prove they have a parking space before they can buy a car. With such a population density, the only practical possibility for transport across the country is rail. 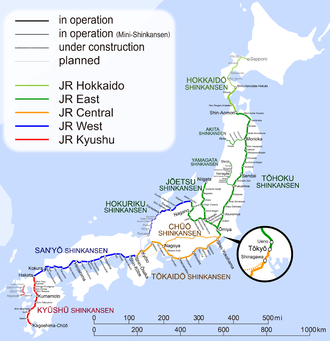 The recognition of the interrelationship between land development and the high-speed rail network led, in 1970, to the enactment of a law for the construction of a nationwide Shinkansen railway network. By 1973, the Transport Minister approved construction plans for five additional lines and basic plans for twelve others. Despite the approval, financial considerations intervened; the cost of the five lines (five trillion yen, or roughly 18 billion U.S. dollars at the 1973 exchange rate), combined with the oil crisis and the recession of the 1970s and early 1980s resulted in some lines being cancelled and others delayed until 1982. The hosting of the 1998 Winter Olympics in Nagano provided Japan with a valuable opportunity to showcase its technological skills with the opening of a new rail line extension, the Nagano Shinkansen from Tokyo to Nagano. The national rail system (JNR), which included Shinkansen was broken up and privatized beginning in 1987 with the aim of more efficient and profitable operations in the passenger rail sector. Incremental improvements to the high-speed rail technology are being undertaken, and the network continues to be expanded. Tilting trains have been introduced to take curves faster; meanwhile, aerodynamic redesigns, stronger engines and lighter materials, air brakes, typhoon and earthquake precautions, and track upgrades are among the developments. As a result of improvements, the travel time from Tokyo to Shin-Osaka (the first route opened) has decreased from 4 hours in 1964 to 2 hours 25 minutes in 2007. A Japanese consortium led by the Central Japan Railway Company have been researching new high-speed rail systems based on magnetic levitation since the 1970s. Although the trains and guideways are technologically ready and over 100,000 people have ridden them, high costs remains as barriers. Test trains SCMaglev MLX01 on the Yamanashi Test Line have reached speeds of 581 km/h (crewed), making them the fastest trains in the world. These new maglev trains are intended to be deployed on new Tokyo–Osaka Shinkansen maglev route, called the Chuo Shinkansen. On May 2011, JR Central announced the company will start operation of maglev route from 2027 between Tokyo–Nagoya followed by Nagoya–Osaka route by 2045. Projected travel time for Tokyo–Nagoya (286 km) is 40 minutes. South Korean KTX high-speed rail, which runs on a dedicated line, became operational in April 2004, and was the third nation outside Western Europe to have high speed intercity service, after Japan and the US. The maximum speed of the KTX, which derives its technology directly from France's Alstom TGV, is 300 km/h. A journey from Seoul to Daejeon that previously took around 90 to 120 minutes now takes only 49, and the time from Daejeon to Daegu (Dongdaegu St.) has been similarly reduced. Passengers can save up to 2 hours on journeys from Seoul to Busan. Since service began, there have been many complaints about the trainsets, citing general discomfort, together with seating that faces opposite the direction of travel. However, rail demand rose 25% in the second three months of service (April–June 2004). Rail revenue in general increased more than 91% from the previous year with 33% more seats offered. Recent observations indicate a growth trend and increasing public acceptance of the service. Daily ridership is now in the range of 85,000 passengers. Diversions from other modes show wide variability, according to customer surveys. KTX enticed 56% from existing rail services, 17% from air, 15% from express buses, and 12% from highways. With the development of the HSR-350x, South Korean media argue that Korea came to be the fourth nation to develop high-speed rail independently, and the seventh nation to acquire the technology. However, the statistics should vary according to the multiple definitions of a high speed rail. The "High Speed Rail 350x" went under development by South Korean engineers several years before the French technology-transfer program. The train is a product of nearly 10 years of research and development by the Korean company Rotem and the National Rail Technology Institute of Korea. Called the "Korean G-7" (a direct reference to Korea's ambitions of joining the technological prowess of G-7 nations) this technology is currently in its test-run phase and is scheduled for initial passenger operation through the Seoul-to-Gwangju sector by 2007. The proposed train would run faster than the TGV, at 350 km/h as opposed to 300 km/h. The Korean G-7 incorporates several technologies the French TGV doesn't, including an aluminum body, digital traffic control, and a pressure compensation system. When operational the Korean G-7 will also allow passengers to rotate their seats, giving them the choice of a forward-facing or a rear-facing seat, in response to the many complaints about the fixed one-directional seating arrangements on the KTX. In July 2006, the South Korean government announced their plan to develop an upgraded version of the G-7 called HEMU(Highspeed Electric Multiple Unit-400㎞/h eXperiment) train system by 2011. Rotem, a member of the Hyundai group, also manufactures magnetic levitation trains. They were first introduced in the 1993 Daejon International Expo. Taiwan High Speed Rail, also known as the THSR, is Taiwan's high-speed rail network, running approximately 345.50 kilometers (215 mi) from Taipei to Kaohsiung, and began operations on January 5, 2007. Adopting Japan's Shinkansen technology for the core system, the THSR uses the Taiwan High Speed 700T train, manufactured by a consortium of Japanese companies, most notably Kawasaki Heavy Industries. The total cost of the project is currently estimated to be US$15 billion, and is one of the largest privately funded transport schemes to date. Express trains capable of travelling at up to 300 km/h (186 mph) travel from Taipei City to Kaohsiung City in roughly 90 minutes as opposed to 4.5 hours by conventional rail, although local service THSR trains take approximately two hours when stopping at all stations en route. On June 3, 2007, THSR served 5 million cumulative passengers, and on September 26, 2007, the 10 millionth passenger boarded. In the month of September 2007, THSRC carried 1.5 million passengers, growing further to 1.66 million in November and 2 million in December 2007, the latter translating to about 65,000 passengers daily. In the first year of operation, ending December 31, 2007, THSRC's trains were 99.47% on-time, and carried 15.55 million passengers. Thirteen Taiwan High Speed Rail stations were planned in the western corridor, with eight stations already open in Taipei, Banciao, Taoyuan, Hsinchu, Taichung, Chiayi, Tainan, and Zuoying. Five more stations (in Nangang, Miaoli, Changhua, Yunlin, and Kaohsiung) will be built in future years. ^ a b "Tracklaying begins on Beijing - Shanghai HSL - International Railway Journal". 2010-07-22. Archived from the original on 2011-06-13. Retrieved 2010-07-22. ^ "New High Speed 700T for Taiwan Unveiled at Rollout Ceremony" (Press release). Kawasaki Heavy Industries. 2004-01-30. Archived from the original on 2006-04-27. Retrieved 2006-04-21. ^ "Taiwan feiert ersten Hochgeschwindigkeitszug" (in German). Der Spiegel. 2007-01-05. Retrieved 2010-10-07. ^ "Transportation". A Brief Introduction to Taiwan. ROC Government Information Office. Archived from the original on 2006-05-18. Retrieved 2006-05-19. ^ "高鐵時刻表及票價資訊: 2010年12月1日起適用" (PDF). Taiwan High Speed Rail Corporation. Retrieved 2011-01-13. ^ "THSRC sees 5 millionth passenger". The China Post. 2007-06-04. Retrieved 2007-07-13. ^ "營運年度概況". Taiwan High Speed Rail Corporation. Retrieved 2011-01-13. ^ "Four stations to be added to Taiwan high speed rail". Focus Taiwan (CNA). 2010-04-26. Retrieved 2010-10-06. This page was last edited on 15 May 2018, at 01:52 (UTC).